Welcome to the new website and new location! Building work on the new workshop is underway and I should start putting in benches and tools at some point during early Feb. 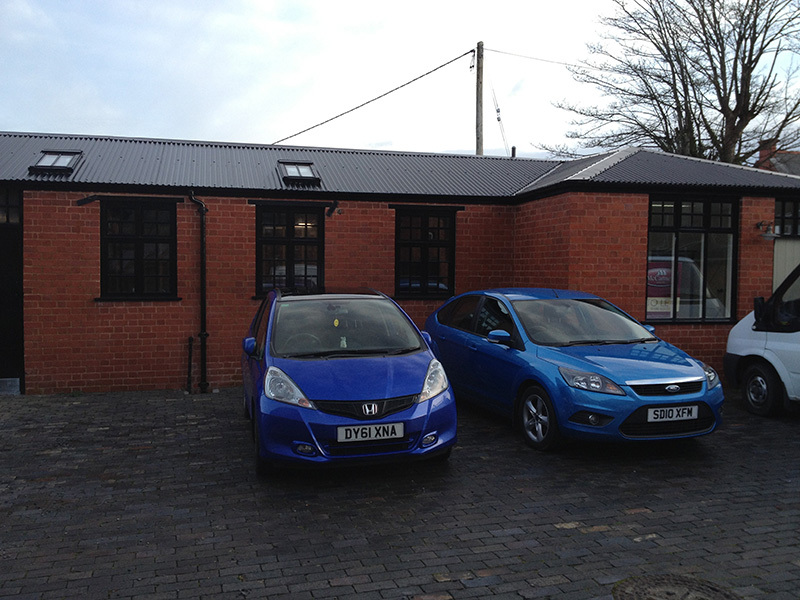 Here are some pics of the new premises. They are in the rear courtyard of Llandidloes Town Hall. Really looking forward getting back to the workbench and to the April and May Guitar making course. Good to see places filling here in Mid Wales – it’s a wonderful place to come for a month and immerse yourself in the world of guitar making. Announcing guitar making courses in April And May 2015. Look at the courses page for details. The October guitar making course has just finished and it was great to see three lovely guitars spring from my new workshop here in Llanidloes, Mid Wales. The guys (who had travelled from France. South Wales and Liverpool) all produced very finely built instruments with great attention to detail including some nice inlay. They all played beautifully and sounded superb. Here's a quote from one of them just received, "Thanks Richard, I'm still on Cloud 9! Thank you again for a wonderful experience and making sure we delivered on beautiful, looking and sounding instruments." And here's some pics . Just caught the BBC Radio 2 Folk awards on iplayer and saw one of my guitars (Cedar and Koa Damselfly) being played by Calum McColl with Guy Garvey from Elbow on a Tribute to Calum's Dad, Ewan McColl. They did a version of Ewan's classic, "The first time ever I saw your face". Hi Folks, I'm happy to announce that I have now officially relocated! I am in the second full week of my first guitar making course in my new Mid Wales workshop. It is a one-to-one with a student who's travelled from Surrey for the month and alongside this i'm making a new batch of instruments and getting to know my way around my more spacious premises! I am really enjoying the new setting and it's perfect for my courses with a more efficient layout, great natural light and fab kitchen facilities to boot. I'm also right in town with cafes and shops right on the doorstep. We've had wonderful weather too this Spring which really shows off the majesty of the surrounding mountainous landscape. I've already had customers visit from my old Sussex area and have taken them to sample one of the regular evening folk sessions in town - there are some great musicians up here in the hills! Let me know if you want to make the trip and I can always help advise on accommodation etc.